Back in October last year I wrote a post about Smythen Street, once one of Exeter's most important medieval routes. Apart from a medieval fireplace hanging halfway up the wall of a late-19th century warehouse I was unaware that anything of historical interest still existed in the street, much of which was torn down between 1930 and the 1960s. But it seems that one building older than the late 19th century does indeed survive and has recently been threatened with almost total demolition. The house in question was formerly known as No. 30 Smythen Street and can be found at the back of Nos. 102-104 Fore Street. Part of it is visible in the photograph left and below, facing onto the grot of modern-day Smythen Street, an admittedly unprepossessing facade spanning three floors with a partially slate-hung gable end with a further collection of associated buildings at the rear, not visible from the street itself. About ten years ago the building was investigated by the Exeter Archaeology Unit [part of Exeter City Council, the much-valued EAU has recently been axed as part of the city council's cutbacks after 40 years in existence]. At the time of the EAU's investigation the building was being repaired with the aid of a grant and the EAU's findings revealed that parts of No. 30 date back to the 15th or 16th centuries, probably a unique fragment of the collection of medieval buildings known as Butchers Row, most of which were demolished in the 1830s to build the Lower Market. The core of the building is a medieval merchant shop, rebuilt above first floor level in the late 18th century and remodelled again in the 19th century. 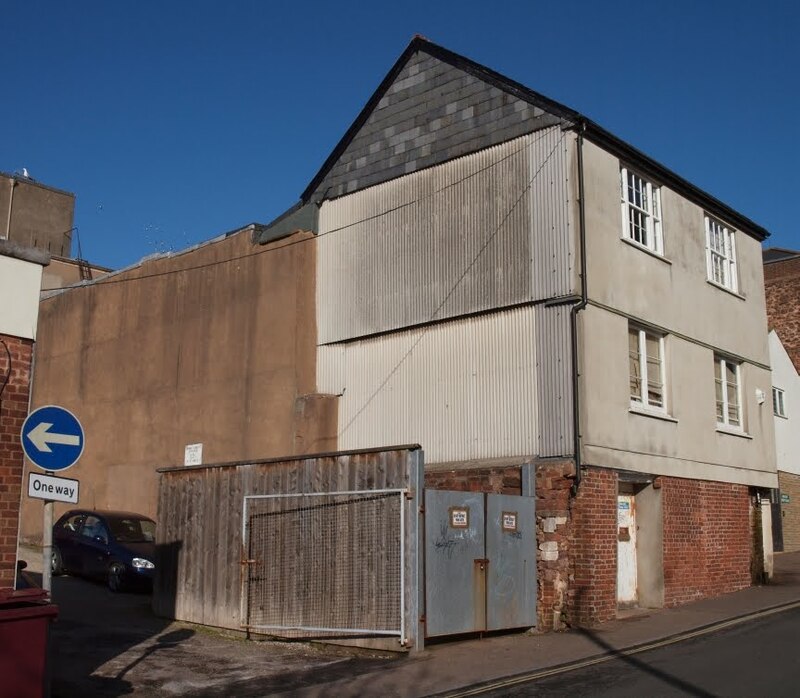 "The DBG objected to this application as it involved the almost complete removal of a much repaired but extremely historic 15th or 16th century building at the rear of the development facing onto Smythen Street. 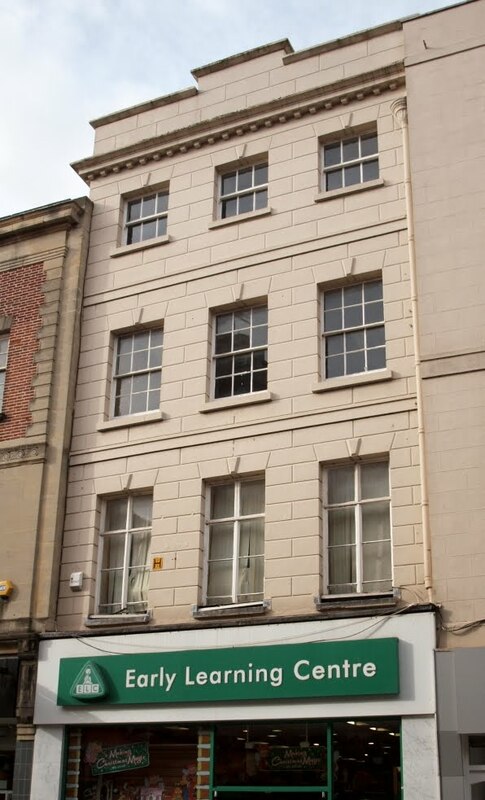 This building is included within the Exeter Local List of buildings of historic interest. The replacement building was in an entirely modern idiom. We believed that the City Council had taken on board our objections and, although we were given no opportunity to see them, understood that revised plans had addressed the conservation issues. In fact these revised plans, although incorporating internally some of the historic features which were previously to be destroyed, still completely remove the existing street elevation of the building which was carefully reconstructed in 1999 following a detailed analysis of its historic importance by Exeter Archaeology. Moreover we understand that this reconstruction was actually grant aided under the Conservation Area Partnership shared by English Heritage and the Council! We strongly regret another development which will reduce the historic quality of the conservation area and the city." The statement is dated April 2011. 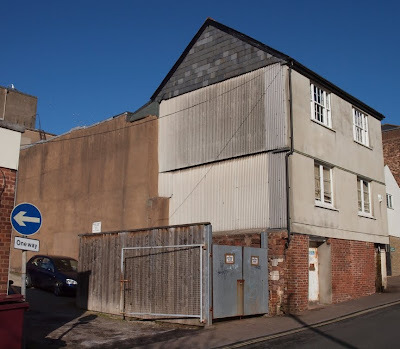 It seems unbelievable that the council would even consider allowing the building to be altered, let alone demolished, especially given the paucity of historic buildings in Exeter's old West Quarter (or the city centre generally for that matter). The council's own Exeter Local Plan Policy C3 states that alterations and extensions which harm the architectural or historic value of the building will not be permitted. The revised plans would apparently retain the "original basement and ground floor footprint", whatever that means, and the Heavitree stone walls would also remain along with some roof trusses. Despite the stipulations of the Local Plan Policy, it seems likely that the development will be given the green light by the council's planning department and much of the building will be demolished, including the Smythen Street facade, the remnants subsumed into a completely new structure. If the Devon Buildings Group hadn't intervened then it's possible that everything would've just been bulldozed out of existence. (Three late-Georgian brick-built townhouses in Sidwell Street, Nos. 70-73, are also currently under threat of demolition, some of the last pre-war survivors in a street almost completely destroyed by the Baedeker Raid in 1942 and by massive post-war demolition. There have been a number of objections made by individuals and organisations, including English Heritage, and despite initially allowing the demolition of the buildings, the city council has been forced to reconsider. A decision is currently pending.) An update on the fate of No. 30, Smythen Street will be posted when more is known. 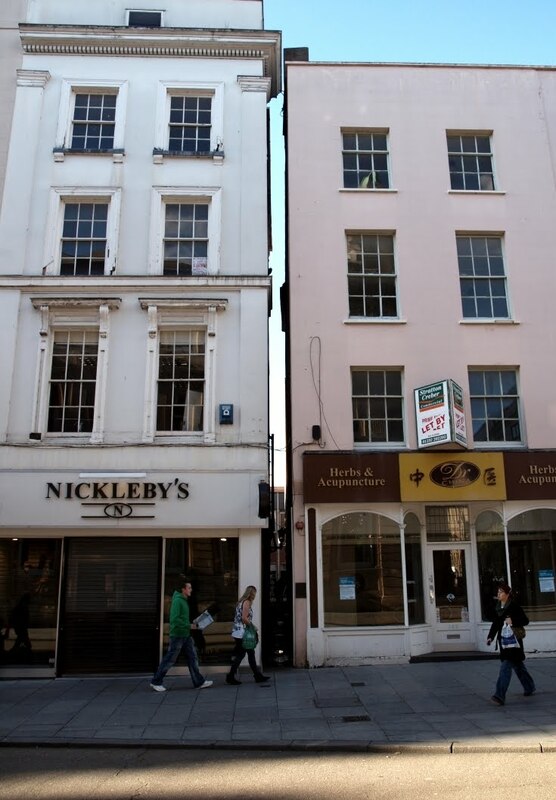 Carrying on up the north side of the surviving pre-war section of the High Street, between Parliament Street and the Guildhall, stand another three buildings of some historical interest: Nos. 199, 200 and 201 left. Despite its unprepossessing 18th century exterior, with plate glass installed into sash windows and the odd arrangement of the windows within the facade, No. 199 is older than it appears. 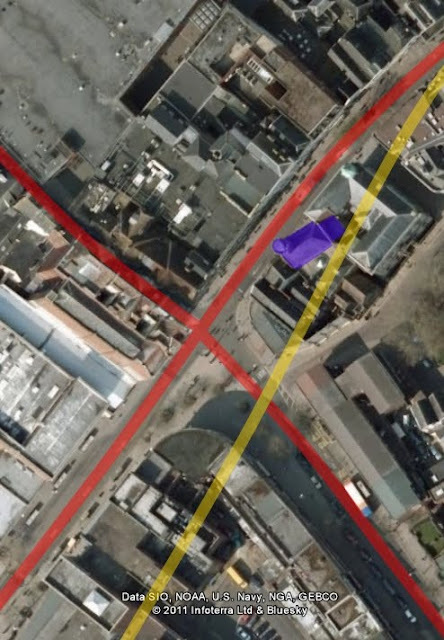 The first clue is the extremely narrow site on which it sits and which is almost certainly an echo of a 14th or 15th century medieval tenement plot, a long, narrow strip of land that stood at right angles to the main street. Hidden behind the shop sign (Whittard) is the suggestion of a jettied first floor and the core of the building is thought to date at least to c1500. 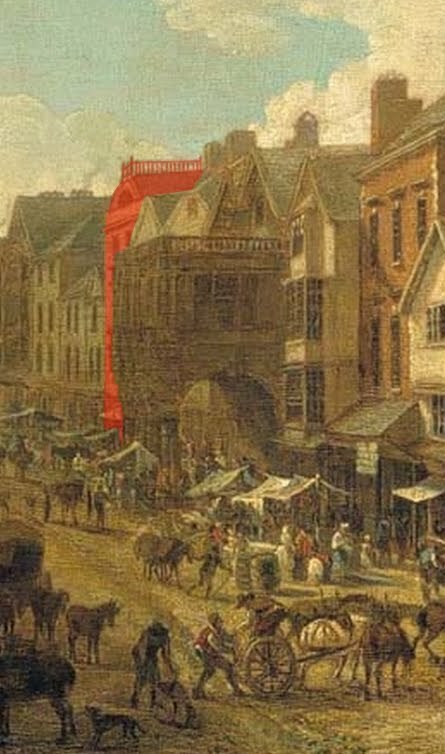 A mid-18th century painting of the High Street shows that the the fourth floor is a relatively recent addition and that the property originally had a pitched roof with the gable end clearly visible from street level. All becomes clear in an article written by Harbottle Reed in 1931. The article, entitled 'Demolition of Ancient Buildings of Exeter', recalls that No. 199 underwent significant modification and demolition in 1904. The building originally consisted of a front block and a rear block with a courtyard in the middle. Within the courtyard, according to Reed, was a "massive timber front of 15th century date having cusp-headed lights". If left untouched then this would've been an exceptional survival in the city but unfortunately much of the 15th century work was apparently demolished in 1904. Still, No. 199 is a Grade II listed building and although it wasn't inspected internally when it was granted listed status in June 2000 it's possible that earlier features remain in situ. Its neighbour, No. 200, also Grade II listed, is a much more attractive building, marred only by the ugly modern shop front. Dating to the mid-18th century and spread over four floors, with an attic room in the truncated gable end, it has rusticated quoins at the corners and a decorative frieze emblazoned with rosettes above the fourth floor windows. The gable end with its three-light semi-circular sash window looks like a later addition but is in fact contemporary with the rest of the facade. This building appears in a late-18th century painting of the High Street (detail right, No. 200 highlighted in red with No. 199 to its immediate left). Exeter City Council's 2002 Conservation Report believed that No. 201 is the "pair" of No. 200 but it's clearly of a totally different build. It would've been given Grade II listed status had the facade not been mauled in the mid-1960s. Up until then No. 201 had a pitched roof, the gable end visible from the High Street, with a single large sash window on each floor. These were all replaced with the current flat roof, modern windows and the curved bow window on the first floor. Combined with the intrusive modern shop front and the peeling paint on the facade, these regrettable changes successfully mask the 18th century or earlier core of the building itself. The photograph below, dating to c1870, shows the Guildhall. The facade of No. 201 as it appeared prior to the 1960s 'modernisation' is highlighted in red. Sandwiched between No. 194 and No. 195 High Street left is Parliament Street. 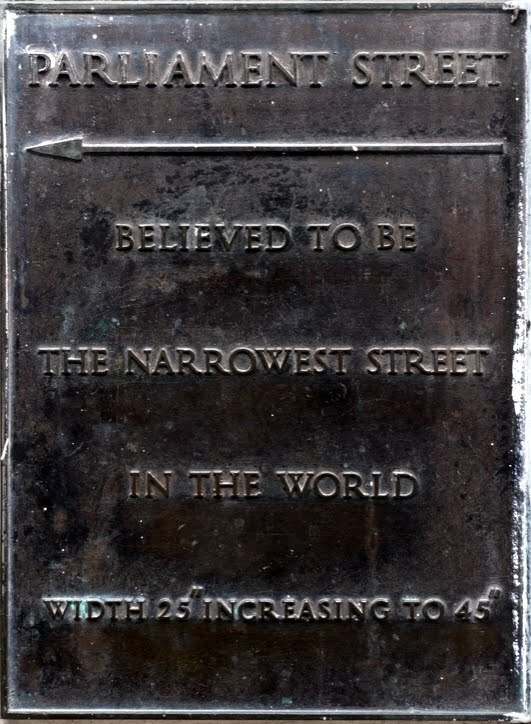 A bronze plaque near the entrance from High Street confidently states that Parliament Street is "believed to be the narrowest street in the world"*. It most certainly isn't but it is an interesting relic from Exeter's medieval past. The alignment of the street itself, and its narrowness, dates back to the Middle Ages. Providing no-one else is coming in the opposite direction it forms a convenient shortcut from the High Street into Waterbeer Street, another very ancient thoroughfare. In reality it is now just a gap left between the buildings on either side, just 64 cms wide at the High Street before opening out to a spacious 122 cms by the time it exits into Waterbeer Street. 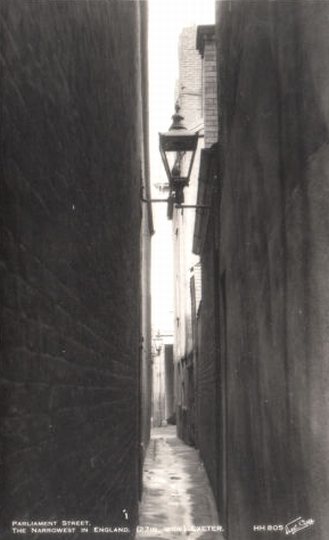 Originally called Small Lane, Hoskins believed that its current title only dates to around 1832 "when the Reform Bill put Parliament in the news" and that "the precise point of the name is not clear: perhaps it is an obscure joke." If it was a joke then it was probably not complimentary towards Westminster. Hoskins also adds that in 1836 the residents of Parliament Street petitioned the local authority to have the street widened and subscribed £130 for this purpose, but nothing was done and the "street remains one of the narrowest in England". Apart from its origins, there is little that is ancient about Parliament Street now unfortunately. Two thirds of the walls were rebuilt in modern red brick in the 1970s as part of the Guildhall Shopping Centre. The postcard view right shows Parliament Street prior to its rebuilding when it still had some character. However the two properties that mark the entrance into Parliament Street from the High Street, Nos. 194 and 195, do have some history. No. 194 is discussed here, along with its neighbours Nos. 192 and 193 High Street. No. 195, the pale pink structure to the right in the photograph at the top of this post, has a complicated history. It is a Grade II listed building and has a simple mid-19th century stucco facade spread over four floors with a cellar beneath. 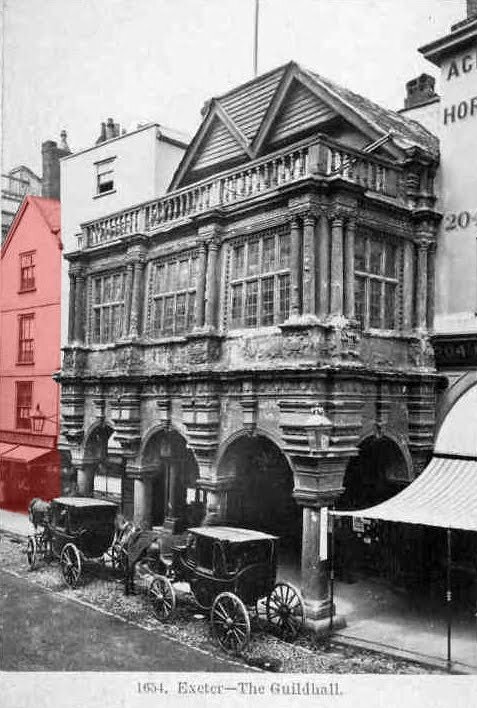 The early-20th century shop front is a rare survival in the High Street, but behind the early Victorian facade is a much earlier structure dating to c1700. As suggested in another post, it seems likely that No. 195 is the rebuilt front block of what was once a 16th century townhouse. Its twin was at No. 196 High Street, although that was demolished in 1973. No. 195 escaped demolition and its rendered masonry side wall now forms part of Parliament Street. The interior contains much of interest. The upper floors are all accessed via a fine late-17th century staircase, although the lower section was replaced in the 1800s. There are also stretches of 18th century panelling and a late-17th century bolectian moulded ceiling. A 16th century carved overmantel showing the Judgement of Paris in bas relief was removed from the house in 1928. It's possible that the panel had been reused from the earlier building on the site. It is now in the Royal Albert Memorial Museum in Exeter. Probably originating in the Netherlands and shipped to Exeter c1600, the overmantel above shows Athena to the far right, dressed in a warrior's helmet and holding a spear, her shield resting on the ground. In the centre is Hera with a peacock, the sacred symbol of the goddess. The two figures on the left depict Paris presenting Aphrodite with the apple. As well as being a beautiful object in its own right, the panel also illustrates how Exeter's most wealthy citizens surrounded themselves with opulent decorative artwork. As a building, No 195 High Street is typical of much of the city prior to World War Two, with a rich and varied history hidden behind later additions. *The world's narrowest street is reputedly Spreuerhofstrasse in the German city of Reutlingen which is half the width of Exeter's Parliament Street. Almost directly opposite St Petrock's church stand three of the High Street's few remaining 18th century buildings. All three have been given Grade II listed status, but their interest really lies in the fact that they've survived at all when so much else in the High Street has been lost. Nos. 192, 193 and 194 left are typical of how much of the High Street appeared prior to the air-raid of 04 May 1942 which destroyed 50% of Exeter's most important thoroughfare. The remaining 50% was then badly-mauled by post-war redevelopment with the demolitions of the remaining pre-war section continuing into the 1970s (two of the worst examples being the demolition of the Tudor merchant house at No. 37 High Street in the 1950s and the total removal of the fine Victorian terrace on the corner of Queen Street and the High Street in 1971). According to the listing description, all three properties were put up at the same time as one build, either in the early 18th century or before. Each one is built around a timber-frame with a stucco facade, altered over time to give the impression of three distinct and separate structures. It was a common practice throughout the 18th century to replace earlier facades with something more fashionable so it's possible that the core of the buildings actually date to the mid-to-late 1600s. The facade of No. 192 right dates to the mid-19th century and is probably the result of a major fire on the premises in 1847. Recording work carried out by Exeter Archaeology in 2001 suggested that the site was possibly the location of two merchant houses which were united into a single property and much-altered c1800, although nothing of the the earlier structure is now visible inside. The building is split over four floors with a rusticated stucco facade and dentil cornice running above the third floor windows. Each storey is separated by a string course with a gradual diminution in the size of the windows, typical of much neo-Classical architecture. It's unfortunate that the appearance of No. 192 has been so spoilt by the addition of a large modern shop front. I am unaware of any internal features of interest. No. 193 is fairly nondescript. It too is built on a timber-frame carcass but the rendered facade is very plain with only the two arched windows on the second floor providing any visual interest. Again, the hideous modern shop front does it no favours whatsoever. No. 194 below is probably the most attractive of the group of three but the facade at least is in poor condition left with flaking paint and rotting architrave surrounds to the windows. Once again a timber frame supplies the main support for a stucco facade that dates to the early 19th century. Visually, the facade is framed by two pilasters that extend from the first floor almost up to the dentil cornice. 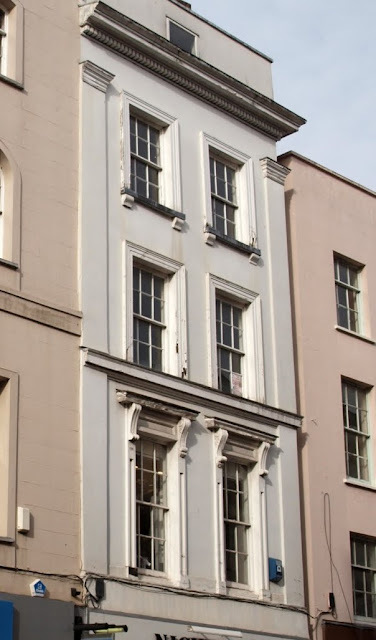 The flat pediments of the first floor windows are supported on ornate moulded brackets, a string course dividing the first and second floors, and the retention of the original glazing bars in the windows adds a great deal to the facade's overall appearance. Parliament Street, reputedly one of the narrowest streets in the world, runs to the right of the building into Waterbeer Street. 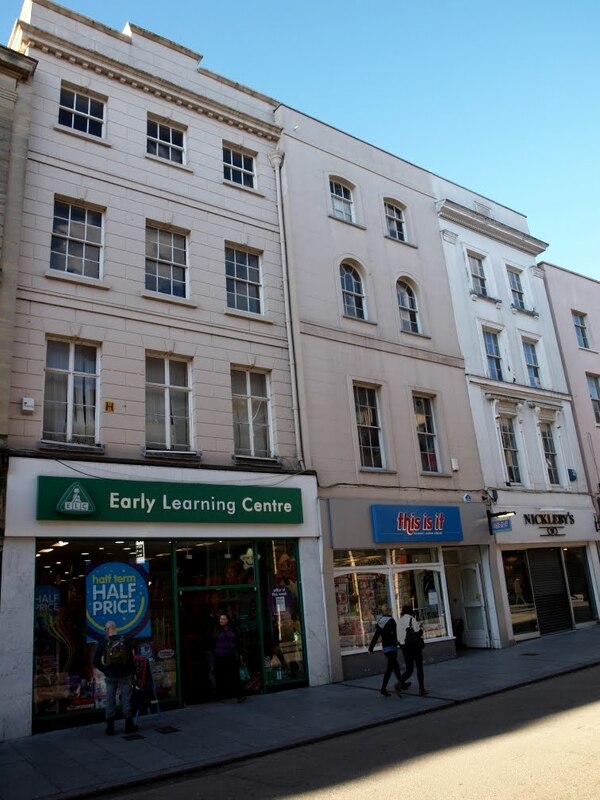 No-one would claim that these are Exeter's finest buildings but they add a sense of variety and interest to a street that is generally lacking in either. Of the four medieval parish churches that once existed on the High Street only two now remain: St Stephen's and St Petrock's left. The Church of Allhallows was demolished for road-widening in 1906 and St Lawrence's was badly damaged in 1942 and later removed. Legend states that St Petroc was the son of a Welsh king who travelled from Ireland to Cornwall in the mid-6th century, settling first in Petrocstow (modern-day Padstow) before founding a monastery at Bodmin. After travelling from Brittany to Rome, St Petroc passed through Devon, where up to seventeen churches dedicated to him still survive. St Petrock's in Exeter is one of them. Like Exeter's other churches dedicated to a Celtic saint (e.g. St Kerrian's in North Street), the foundation of St Petrock's is ancient. Perhaps St Petroc himself was responsible. Exeter in the 6th century was just emerging from the ruins of its Roman past and was slowly transforming into what would become an important Anglo-Saxon centre and it's certainly possible that St Petroc himself stopped at 'Caerwisc' on his journey through Devon. The little guide to the church issued by the Diocese of Exeter states that St Petrock's is "possibly as ancient a church foundation as any in the city". It possibly even predates the foundation of the former monastery at St Mary Major in the 7th century. 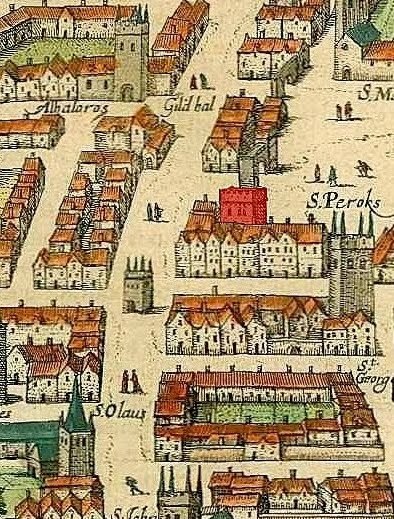 The 1587 map of the city right shows the tower of St Petrock's highlighted in red, peeping out from the houses that fronted onto South Street. The church is labelled "St Peroks". The great pinnacled medieval water conduit that once stood almost in the centre of the Carfoix is visible to the left. Also visible are the churches of St George, St Olave and Allhallows. No physical traces of the Celtic church remain today, but despite Cresswell's claim that structural alterations have "stripped [the building] of all architectural merit" the existing church still retains some interest beyond the historical importance of its early beginnings. Nothing is known of the very early phases of the church building. The Anglo-Saxon structure itself probably went through various stages and alterations. No doubt it was altered again after the Norman Conquest of 1066 and it was specifically mentioned in a mandate by Bishop Marshall in 1191 and again by Peter de Palerna in his Deed of Assignment of c1200. 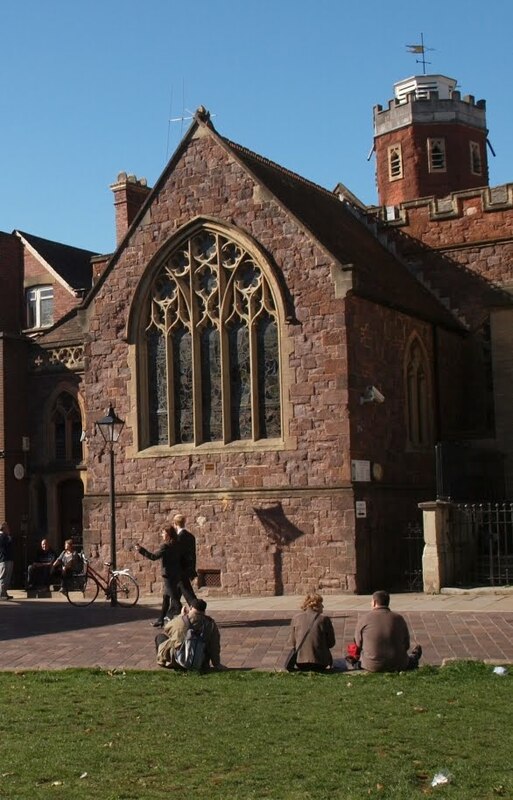 The location of the church alone indicates its former significance, standing almost in the very centre of the city, at the junction of Exeter's four most important streets (High Street, North Street, South Street and Fore Street (or perhaps Smythen Street). The crossroads at which these four thoroughfares met became known in the Middle Ages as the Carfoix or Carfax, itself derived from the French quatre voix meaning the 'four ways'. Its position within the city meant that St Petrock's medieval and Tudor congregation consisted of many wealthy merchants and civic officials, despite the relatively small size of its parish. The most important development for St Petrock's in the 13th century was the apparent rerouting of the High Street. 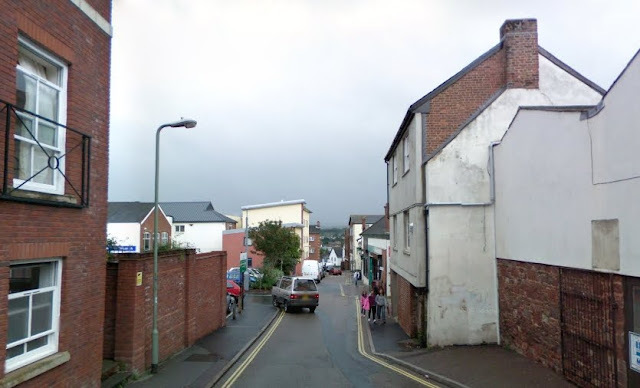 Until 1286 the main East-West route through Exeter is thought to have run from the West Gate, up Smythen Street and then on up the High Street to the East Gate. It's difficult to imagine now but St Petrock's is believed to have stood to the north of the High Street and not to the south as it does today. The church was essentially on the other side of the road. The aerial view left shows the pre-13th century footprint of St Petrock's highlighted in purple, much smaller than the church which exists today. Exeter's four main roads are highlighted in red. The course of the High Street as it perhaps existed before 1286 is highlighted in yellow. The reason behind the alteration to the street plan was the murder of the Cathedral's precentor, Walter Lechlade in November 1283. Following a visit to the city by Edward I and Eleanor of Castile in 1285, the cathedral authorities received permission to enclose the entire cathedral precinct within a wall, punctuated at regular intervals by gatehouses. It was decided that the south wall of St Petrock's itself would provide one stretch of the precinct wall. The High Street was therefore shoved northwards so as not to impede the movement of traffic, an alignment which remains to this day. The existence of doors in both the north and south walls meant that the church building acted as a kind of postern gatehouse in its own right, allowing people to access the Cathedral Yard from the High Street. The church was originally founded on a standard east-west alignment and by the 14th century consisted of a simple chancel and nave with a bell tower at the western end. The lower courses of St Petrock's north wall (shown in the photo at the top of this post) date from either the 12th or 13th century. The original height of the 14th century building extended as far as the string course running beneath the clerestory windows. These three windows, with limestone tracery, were added in the 16th century when the roof of the nave and the tower were heightened. The octagonal turret on top of the tower was added in 1736. The plan right shows the evolution of the building from the 14th century until 1881. Note the houses which crowded outside the north wall and the narrow passageway that originally gave access into the church itself. These properties were all removed in 1905. 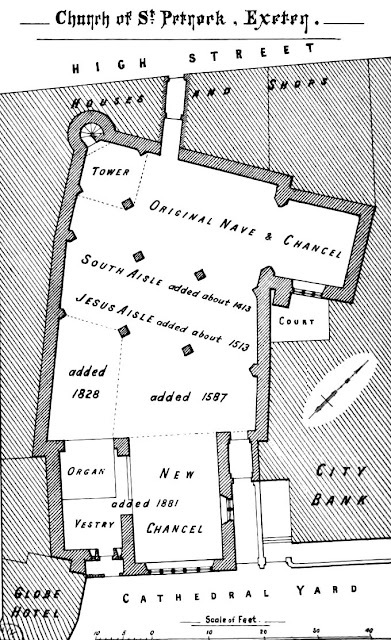 The church was penned in on the north side by the rerouted High Street and at its east and west ends by other properties, so the only room for expansion was towards the south. A new south aisle had already been built in 1413. A second, larger south aisle was added in 1513, named the Jesus Aisle, and this is probably also when the present tower, minus its octagonal belfry, was built. So extensive were the early-16th century alterations that the church was rededicated by Thomas Chard, the last abbot of Ford Abbey, who stood in for the ailing Bishop Oldham. Yet another south aisle was added in 1587. The photo left shows part of the interior of St Petrock's today, looking west towards the tower. The tall, slender pillar to the right supports one corner of the tower itself. The gothic arches to the left, now blocked by modern partitioning, mark the original south wall of the medieval building before the first south aisle was constructed in 1413. The columns and angel capitals date from the additions made in the 16th century. St Petrock's was one of only four of Exeter many parish churches that was allowed to remain operational throughout the Commonwealth of the mid-17th century. Jenkins paid it a visit in 1806 and left the following description: "the Church is an irregular building, which appears to have been erected at different periods, and is so obscurely situated and surrounded by houses, that scarce any part of it can be seen, except the Tower". Jenkins states that the tower held "a clock with a double-fronted dial, that projects over the houses" and which had "a set of chimes, which plays part of the 137th Psalm, at the hours of 4, 8 and 12". 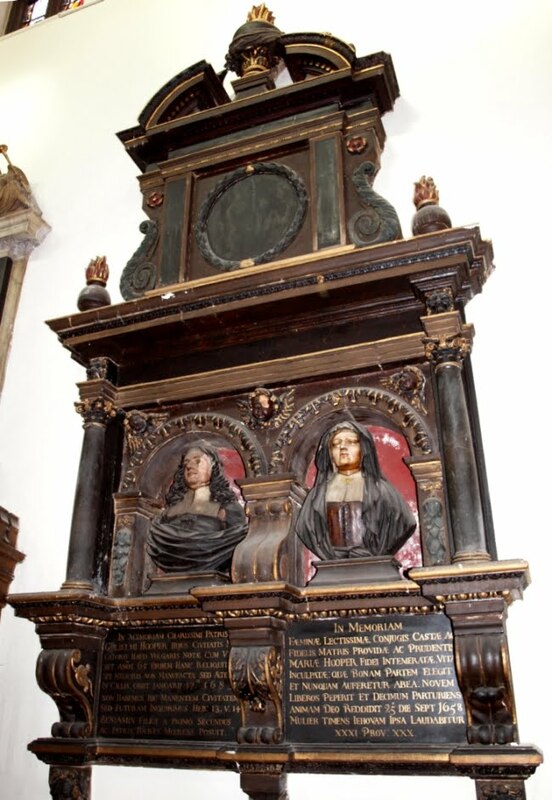 According to one source the clock was believed to date to 1470. This double-dialed clock no longer apparently exists. Jenkins's point about the church being surrounded by other buildings is interesting. The photo at the top of this post shows two blocked windows at street level in the north wall, so at some point the north wall must've been free of obstruction, the windows installed and then blocked at a later date with the erection of houses. The blocking of these windows probably explains why the nave was heightened in the 16th century and the clerestory windows inserted. These dwellings, referred to by Cresswell as "shabby little houses that huddled against the church", were subsequently demolished in 1905, revealing once again the north wall (and the blocked windows). 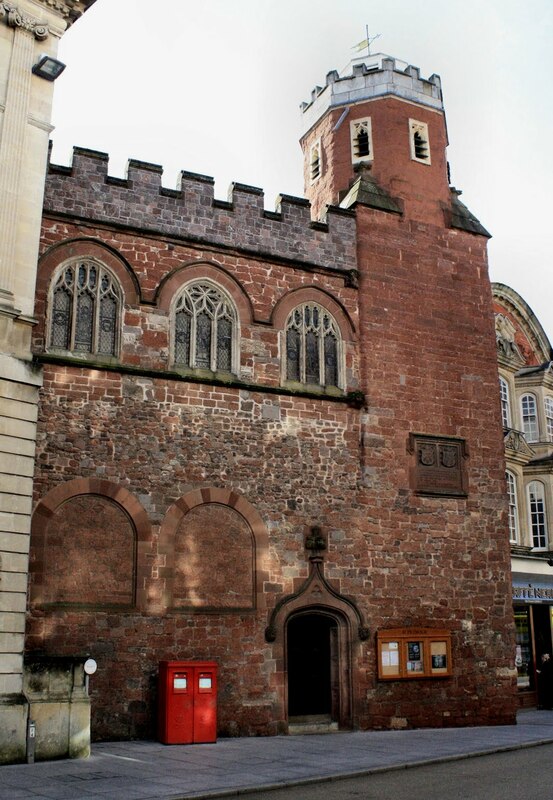 The tablet on the wall of the tower states: "Obscured for two centuries, this church and tower were again brought into view by the widening of the High Street in the year of Grace 1905" above which are carved the heraldic arms of Exeter Cathedral and the arms of England. The poppy head ornamentation around the north door was also added at this time. The photo left shows the 1881 chancel from Cathedral Yard with its five-light traceried window, the octagonal belfry visible in the background. In 1828-1829 yet more alterations were made when the south aisle of 1587 was enlarged to designs by Charles Hedgeland, the son of Caleb Hedgeland. The vaults were sealed over, new windows were let into the roof to improve the internal lighting, a new organ was installed and a new altar-piece was added to the chancel. Trewman's 'Exeter Flying Post' reported that the church had been "nearly rebuilt" when it opened its doors again on 15 November 1829. And then in 1881 even more alterations were undertaken. By now the church had totally outgrown its 14th century form of a nave and chancel, and the almost endless extensions had created a church which was wider than it was long. The 1881 extension resulted in a drastic rearrangement of the church's interior. A new chancel was built to the south and the liturgical orientation of the church was turned through 90 degrees resulting in a north-south alignment with the altar at the south end. The old medieval chancel was converted into a baptistry. These changes led the notable architectural historian Nikolaus Pevsner to declare that the interior of St Petrock's was "among the most confusing of any church in the whole of England". The chancel was built on land purchased from the nearby Globe Inn (destroyed in 1942) and had an exposed pine roof, the chancel arch supported on small columns of Devonshire marble quarried from Ipplepen. A small lobby gave access into the Cathedral Yard and this is essentially how the church remains today. St Petrock's contains a number of fine 17th and 18th century memorials, including the one shown right to William and Mary Hooper and which dates to the mid-1680s, the oldest being a tablet commemorating William Hurst, five times mayor of Exeter who died in 1568. William Hurst founded the almshouses which took his name outside of the East Gate and which eventually became the site of the Regency Devon and Exeter Subscription Rooms. Also placed here is John Weston's 'Last Judgement' sculptural tablet which was relocated following the demolition of St Kerrian's in North Street in 1878, described by Pevsner as "a remarkable piece of carving". The belfry holds six bells, dating from the 15th to the 18th century and which are believed to be one of the lightest peals of six anywhere in Britain. The parish registers are some of the most complete in Devon too, surviving uninterrupted from 1538, the first year that Thomas Cromwell ordered that they be kept in every parish across England. The large collection of silver plate dates to between 1572 to 1692. Not surprisingly, most of the historic buildings which once formed part of the parish of St Petrock's have been destroyed. The image left shows a 1905 map of the city overlaid onto a modern aerial photo. Only those buildings that lay within the historical boundary of St Petrock's parish are highlighted. 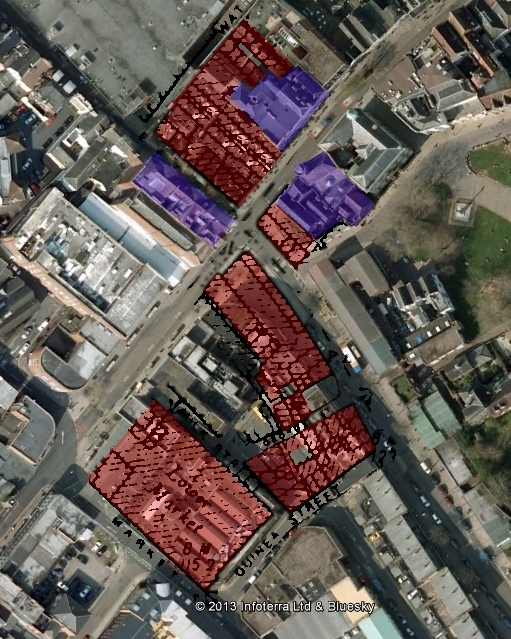 Buildings demolished since 1905 are highlighted in red, a consequence mainly of wartime damage in 1942 and, north of the High Street, post-war redevelopment for the Guildhall Shopping Centre. The only buildings in the parish that pre-date 1905 are highlighted in purple. The most significant change in recent years has been the division of the church into two areas. The only area now open freely to the public is accessed via the north door in the High Street. A partition has recently been installed which divides the church roughly at a point where the original medieval south wall once stood, returning St Petrock's to something close to its medieval proportions. The rest of the building, including most of the 16th century and later alterations comprises the premises of a charity for the homeless, called 'St Petrock's'. It's worth visiting the accessible part of the church though, despite what Pevsner called its "peculiar secular character", as the interior is remarkably light and airy. 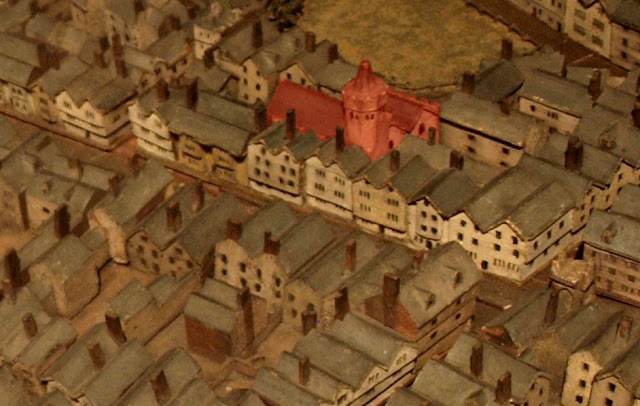 The photo below shows St Petrock's as it appears on Caleb Hedgeland's early 19th century model of Exeter. The High Street can be seen running in front of the church with properties obscuring its north wall. The passageway that led to the church's entrance was through one of the houses on the High Street.